Using several layers of a neutral brown, you can create wonderful contrast by adding handmade flowers in bright pink. Here is a lovely idea for a Wedding banner. The Grand Dies from Spellbinder make constructing an easel card a breeze. 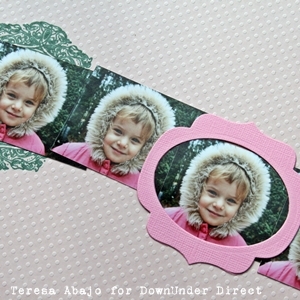 I love making easel cards and these dies make the process quick and easy. 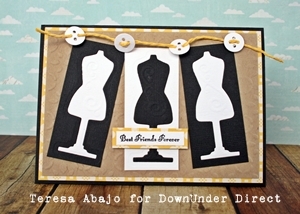 In this tutorial I will show you the steps involved for making a basic shaped easel card using the Grand Labels Four Die. Cut three pieces using your desired Spellbinder shape and size. For my card I've used the second smallest die. Find the centre and score along the width of one of the cut pieces. Score approximately 1cm from the top of the die. Flip your cardstock over and apply double sided tape to the folded edge. Turn the cardstock back over and apply tape to the bottom half of the piece. Attach the folded piece to base piece along the top as in the photo. Remove the backing from the remaining strips of tape and place the third piece on top of this. You should now have a finished base for your easel card. Apply a strip of cardstock or embellishment across the front of the base so that there is something for the card to rest on and keep it open. I've used a piece cut using one of the shapes from the Parisian Accents Dies. "With a couple of daughters who love giving little gifts to their friends, I thought I'd put one of these together. Quite simply, it's a Grand Labels Eleven shape, folded up and stitched along the sides to make a pocket. The cute little tag is from the Home Sweet Home set. I have filled mine with some 9 year old girl essentials: lollies, some lip gloss, an eraser and a lollipop. With Easter around the corner, I'll be whipping up some more of these for nephews and nieces - they're a great way to present cinema tickets or gift vouchers. They're so quick and easy to put together, and they're a lot of fun to embellish." A banner card with a difference. The pennants were made from panels of black and white cardstock with the dressform cut out of them. The white dressform was then swapped into the black panel and vice versa to make a striking card. Using plain cardstocks, you can create your own patterned papers, this time simply mist pink cardstock with black glimmer mist with a lace mask, to add an old world charm. "Pretty in Pink! Here's a multi photo layout with the same little photo repeated. I have framed two of the images - one with a stamp and one with a frame made from two different Nestabilities shapes. I didn't have an alpha that matched, so I drew the letters myself and cut them out by hand. It gives an informal, happy feel to the layout." Today I have another card featuring the new BLING-abilities to share with you. I think you will agree that the addition of some bling can turn an ordinary card into something quite special. What better way is there to tell a friend how much they mean than with a bit of bling? 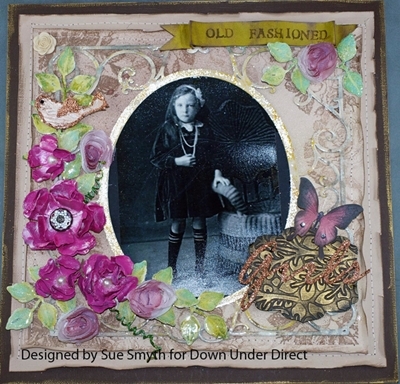 "Have you got lots of spellbinders now like me… well this step by step will show you how to get the most out of your dies. With one simple die I have transformed it into many different shapes to make a banner which is all the rage at the moment in the scrapping world." Cut out 5 rectangles using S4-142 Long Classic rectangles large. Using some scissors cut out a triangle from the bottom of one of the rectangles. This gives you a double point banner. Using a corner rounder round the edges of a rectangle to give it another different shape. Using scissors again cut from the bottom of the rectangle into the centre to make a triangle. These different techniques can be seen on the Happy Birthday Card. Try making other shapes with the dies you have you will be surprised how far you can stretch these dies to suit your needs. Happy Easter to everyone. I hope you are all enjoying the long weekend break. Today we have a layout to share with you. 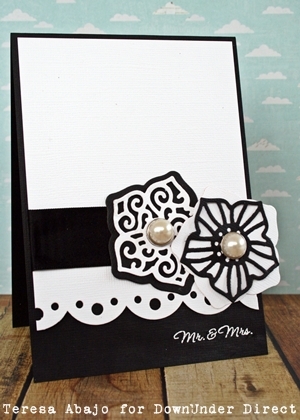 There's little more elegant than black and white with a touch of silver and pearl for a wedding card. Here's a clean and simple one using some new Spellbinder Layered Flowers dies. 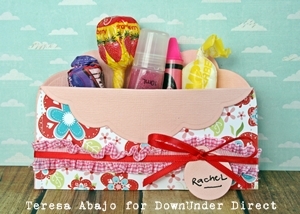 This cute little basket could be used for Easter or Mother's Day. 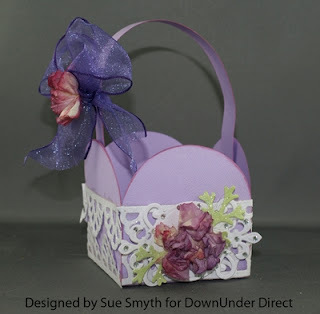 Using the square petal top box die, simply create a handle and attach. Today I have a simple black & white card to share with you.